SKECHERS USA, Inc. (NYSE:SKX) today announced that it has partnered with leading U.S. toymaker JAKKS Pacific, Inc. (Nasdaq:JAKK) to launch a new line of dolls based on SKECHERS’ popular Twinkle Toes character. The initial launch includes four unique dolls that stand 6.5-inches in height dressed in colorful, fashion-forward outfits and light-up SKECHERS Twinkle Toes shoes that complement their bright personalities. Additionally, SKECHERS and JAKKS have partnered to create original digital media content that is animated by the state-of-the-art production team Cosmic Toast Studios. Beginning in July, 11 webisodes featuring the Twinkle Toes doll characters will be released bimonthly on TwinkleToesUSA.com. Each webisode will follow the adventures of the four “Twinkle Girls” as they encounter life lessons and themes such as friendship, the importance of education, and setting goals. 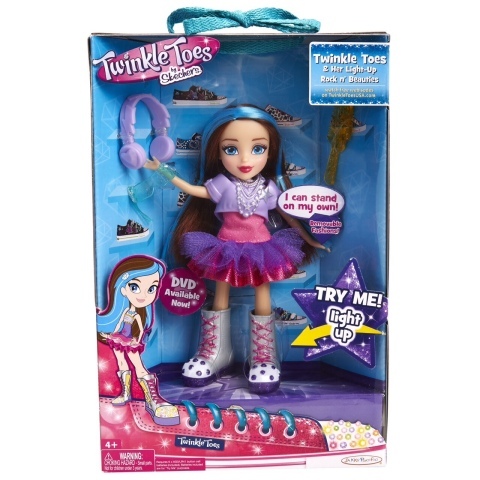 The SKECHERS Twinkle Toes doll line is now available nationwide at Toys “R” Us and is scheduled to launch at select Target retail stores in Fall 2015. SKECHERS USA, Inc., based in Manhattan Beach, California, designs, develops and markets a diverse range of lifestyle footwear for men, women and children, as well as performance footwear for men and women. SKECHERS footwear is available in the United States and over 120 countries and territories worldwide via department and specialty stores, more than 1,050 SKECHERS retail stores, and the Company’s e-commerce website. The Company manages its international business through a network of global distributors, joint venture partners in Asia, and 12 wholly-owned subsidiaries in Brazil, Canada, Chile, Japan and throughout Europe. For more information, please visit skechers.com and follow us on Facebook (facebook.com/SKECHERS) and Twitter (twitter.com/SKECHERSUSA).